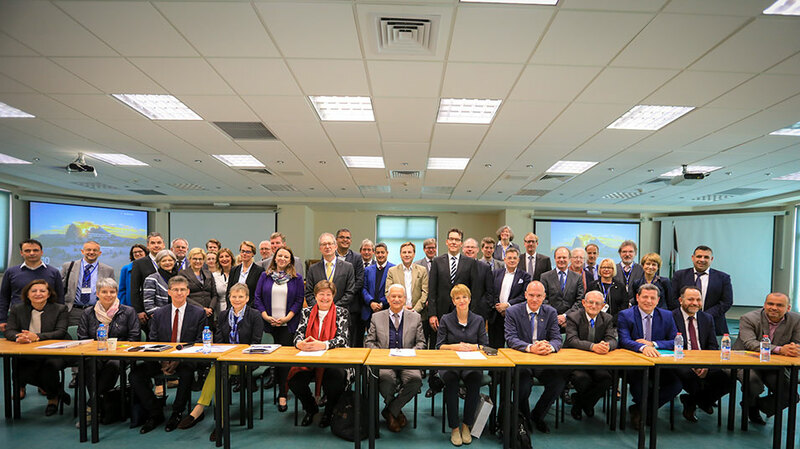 Headed by General Secretary of DAAD Dorothea Rüland and Brandenburg State Minister of Science, Research and Cultural Affairs Martina Münch, a high-ranking delegation comprised of presidents, vice-presidents and heads of administration of German universities visited Birzeit University on March 11, 2019, to learn more about the achievements, challenges and needs of higher education in Palestine, especially at Birzeit University, and identify areas where cooperation could be deepened. 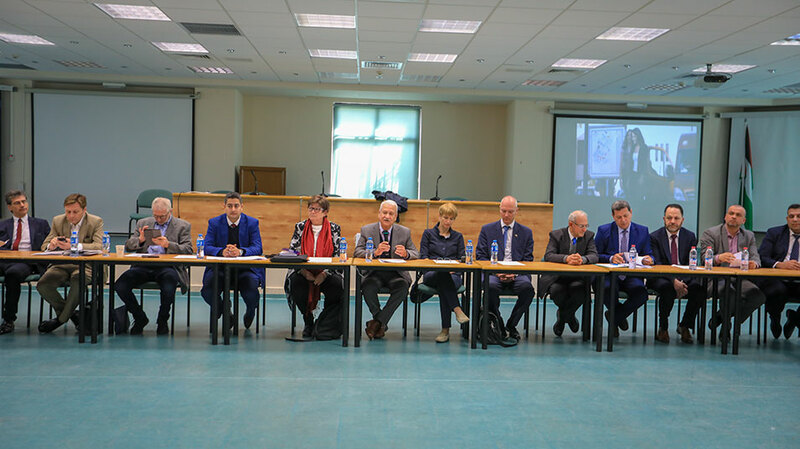 The meeting included the university’s Vice President for Academic Affairs Henry Giacaman, Vice President of Community Affairs Asem Khalil, Vice President of Planning and Development Ziad Mimi, Officer of the External Academic Relations Amir Khalil, and the deans of the Faculty of Education, Ahmad Aljanazrah; the Faculty of Science, Khaled Swaileh; and the Faculty of Engineering and Technology Wasel Ghanem; as well as Director of the Public Relations Office Lubna Abdel Hadi and Assistant to the Director Tina Rafidi. “We are determined to continue our fruitful partnership with Germany and appreciate that it has offered to our students and professors scholarships, fellowships and exchange opportunities that have enabled them to complete their higher education or take up research projects, especially in science and technology, innovation and entrepreneurship,” the president affirmed. Münch reaffirmed her country’s commitment to providing young people with exchange opportunities. She explained that Germany aims to connect universities and create spaces where knowledge can be gained and shared. Rüland talked about the long-standing relationship between the DAAD and Birzeit University. 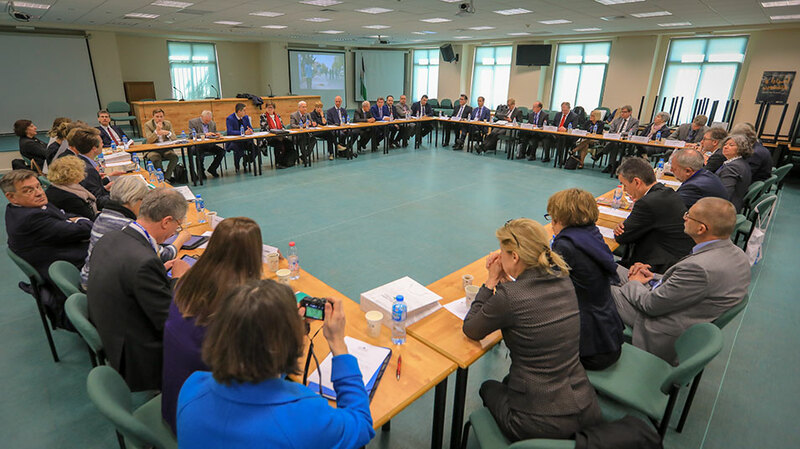 “The DAAD is committed to supporting Palestinian universities. It strives to learn more about their needs and intends to provide continuous support, particularly in the areas of innovation and invention,” she asserted. Vice President for Community Affairs Asem Khalil introduced the delegation to the work of the university’s 11 institutes and centers, describing them as independent bodies with specific missions that join Birzeit University’s faculties and administrative units in their efforts to provide quality education to the students and to contribute to the development of the Palestinian society. “We are not only recipients of knowledge. To make sure that our students and faculty members also produce knowledge, we integrate them with an international research network; we bring minds together and build and maintain connections with our academic, government and community partners,” he said. Khalil mentioned several university institutes and centers that work within such networks, such as the Lancet Palestinian Health Alliance (LPHA) and the Palestine Yearbook of International Law. He indicated their valuable contribution to the Palestinian community and to decision-making processes through, for example, participating in the issuance of new laws and legislation or by building the Palestinian Legal and Judicial System (Al Muqtafi), the first legal databank in Palestine that houses the Legislation Database and the Regular Court Judgments Database. Officer of the External Academic Relations Office Amir Khalil stressed the importance of opportunities to develop cooperation with academic partners around the world. “We are currently members of various unions and academic networks that all serve as bridges and aim to connect academic institutions under the noble mission of education and research,” he stated. Tina Rafidi, the assistant to the public relations director, told the delegation about the Palestine and Arabic Studies (PAS) program that focuses on teaching Arabic to non-native speakers. She pointed out the challenges that higher education in Palestine faces under the Israeli occupation, mentioning especially the restrictions that are imposed on international professors and students whose visas can be obtained only from the Israeli authorities. At the end of the meeting, the parties discussed possible channels of cooperation and met with current students at the German Language Program and with DAAD alumni.